As with other aspects of the Trump presidency, it is impossible at this stage to predict how the day-to-day conduct of foreign policy will actually work out. But in his campaign rhetoric, and also in earlier statements over the years, Donald Trump made it clear that his predispositions are at odds with the orthodoxy that has shaped U.S. foreign policy for the past seven decades. The conjuncture of his accession to the Presidency with a decline in both America’s margin of economic pre-eminence and the public’s appetite for overseas military interventions raises the possibility that we are about to witness the most profound change in the structure of world politics since 1945. It is easier to understand this if we recognize that the nature as well as the scope of the global role that the United States has played in the last seventy years has been a departure from the norms of inter-state relations. Donald Trump has drawn attention to this uniqueness implicitly by repudiating it. In his campaign, he promised he would ‘make America Great Again.’ But his remarks on foreign policy took an opposite tack from the way Russian President Vladimir Putin is seeking to ‘make Russia great again.’ Putin wants to extend Russia’s influence over other countries–particularly its neighbors but now also in the Middle East. Trump on the other hand has talked of reducing or downgrading America’s security commitments–to NATO and also in East Asia. On the face of it, withdrawal or retreat is a less obvious path to greatness than advance. This paradox arises from the unusual character of the international role that the United States has played since World War II. The breadth of the commitments and responsibilities it has assumed is extraordinary. Through a network of alliances with more than 60 states, the United States guarantees the security of countries across the globe, including such wealthy ones as Japan and Germany as well as threatened ones like Taiwan and Israel. Its armed forces have bases of some kind in no less than 65 countries. As Trump has been stressing, all this is costly. The United States is currently spending around $600 billion a year on defense, almost as much as the next fourteen countries combined. There are also non-monetary costs. Its alliance commitments might pull United States into foreign conflicts it could otherwise stay out of–for example, in the Middle East, potentially with Russia over eastern Europe, with China over its expansionist tendencies. As scholarly advocates of ‘restraint’ have emphasized in recent years, the core security of the United States is not dependent on these extensive commitments and responsibilities. Given its geographic position and military power (including its nuclear arsenal), the United States does not need allies to help protect its homeland from attack. In terms of security, it is self-sufficient. Nor are these overseas military commitments dictated by economic interest. With the one exception of its need for imported oil, the nation’s prosperity is not seriously vulnerable to hostile foreign actions. Because of the size and self-sufficiency of its economy, foreign trade is much less important to the United States than it is to most industrialized countries, and in any case American business is well able to make its way in the world without the support of the military. So the world role that the United States has been playing can easily be portrayed as the product of altruism or idealism. Hence it is vulnerable to Trump’s commitment ‘to put America First.’ America First was, of course, the name of the chief organization working in 1940-1941 to keep the United States out of World War II. Its adherents have been described by their opponents at the time and since as ‘isolationists,’ but that is not really an accurate or fair description of their position, any more than it is of Trump’s. 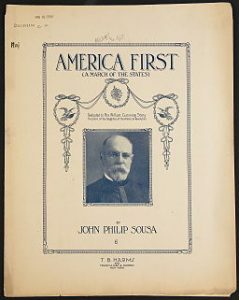 Supporters of America First did not oppose foreign trade or cultural links with other countries. Nor were most of them pacifists, opposed to all use of military force. Indeed, the organization’s manifesto explicitly called for “a prepared America” with “an impregnable defense.” What they were was unilateralists. The United States, they held, should retain its freedom of action, unencumbered by commitments to other countries. This, of course, was the traditional policy of the United States, hallowed by the often invoked injunctions of George Washington and Thomas Jefferson. It was not until the twentieth century that the continued appropriateness of this stance came under serious challenge from people who advanced a broader view of the nation’s interest. The driver of this change was the growth of America’s power, which derived from the pre-eminent size and strength of its economy. By 1913, the United States was producing 32 percent of the world’s manufactured goods; its GDP exceeded that of Britain, France and Germany combined. This dramatic enhancement of the nation’s relative standing had profound effects both on American attitudes and on the country’s position in international affairs. Subjectively, it led many influential Americans, such as Theodore Roosevelt, to believe that the United States now had a responsibility to help maintain a world order from which it benefitted. Objectively, the nation’s new economic and financial strength inescapably made it an important player in world politics. This was demonstrated in World War I when it became clear on both sides of the Atlantic that the outcome of the European conflict would be determined to a great extent by whether or not the Allies had access to American resources and credit. Whatever policy the United States adopted would be momentously consequential. It was wrestling with the dilemmas of neutrality in this new context that led Woodrow Wilson to commit himself to establishing a new world order that would maintain international peace, and so keep the United States free from such complications and threats to its interests in the future. In the brilliant rhetorical and ideological move that was perhaps his most lasting contribution to the discourse on U.S. foreign policy, Wilson linked this project with the nation’s unique historic mission to promote liberty and self-government in the world. When Germany’s submarine campaign provoked the United States to become a belligerent, Wilson made the establishment of such a new world order the goal of America’s war. As Adam Tooze has recently reminded us, World War I further enhanced America’s relative power position. But, as everyone knows, the United States failed to make the commitment to world (and particularly European) order that Wilson had called for and that many at the time, at home and abroad, believed to be both a moral responsibility and a prudent necessity. In the debate over the League of Nations, the handling of war debts, and tariff policy, more narrow views of the national interest prevailed. And there was particular aversion to the possibility of further involvement in foreign wars. The great human and financial costs of participation in World War I, and the enormous disruption to normal life at home it had entailed, were increasingly seen as having brought no benefit. The international scene in the 1920s, and particularly the 1930s, was far from the harmonious world order Wilson had promised; liberty and democracy, far from advancing, were in retreat. Public opinion polls in 1937 revealed that two-thirds of Americans thought entry into World War I had been a mistake, and the Neutrality laws of 1935-1937 were designed to prevent any repetition of the experience. The support for America First in 1940-1941 owed far less to sympathy with Fascism or anti-Semitism than to the simple desire to keep out of foreign wars. As the 1930s ended, the commitment to neutrality was weakened by revulsion at the aggressive behavior of the Axis powers and Japan. After the fall of France in 1940 created the real prospect of a Nazi-dominated Europe, most Americans came to favor aid to Hitler’s enemies. Despite the vigorous efforts of America First, there were healthy Congressional majorities for Lend-Lease in March 1941. But most Americans remained opposed to full-scale entry into the war until the direct Japanese attack on Pearl Harbor. In the next few years, the unilateralist tradition was decisively repudiated. The fact that for the second time in a generation the United States had been dragged into a major war was widely taken as vindication of Wilson’s argument that prevention was better than cure. During World War II, a political consensus emerged that a peaceful, law-governed world order was a sufficiently important national interest to warrant making lasting commitments to other countries and accommodating America’s own actions to the requirements of such an order. An open, multilateral system of international trade and exchange was seen as the necessary bedrock. Consciousness of the unique scale of America’s power engendered an unquestioned confidence that the United States would lead in establishing and maintaining such a system. This enabled American policymakers to largely determine the form that international organizations and regimes would take, thereby making the project more compatible with the unilateralist tradition. But this went along with the assumption that the United States had a general responsibility that should on occasion entail the subordination of its narrow national interests. For example, in the postwar years, Washington lent financial support to a system (the European Payments Union) that discriminated against dollar imports. It has never been easy to gain the necessary political support for measures to maintain world order that involve the subordination of America’s own interests or make significant demands on American resources. The main source of such support has always been international conflict and a sense of threat. It is clear from the record that it was only the Cold War that secured Congressional approval of the Marshall Plan. Similarly, NATO and subsequent alliances were products of the Cold War. More recently, it was the sense of terrorist threat following 9/11 that generated the initial support for military intervention in Afghanistan and the Iraq war. The form of cost to which there has been the most resistance, not surprisingly, is the casualties resulting from military conflict, especially when such conflict is prolonged and not evidently successful. The Korean War as well as Vietnam illustrated this. Less obvious than the sense of threat in sustaining domestic support for costly measures to uphold world order has been the extent of America’s economic and financial pre-eminence. It is no coincidence that it was when this was at its apogee that the nation assumed its wide-ranging commitments and devoted the most resources to defense and foreign assistance. In 1945, the United States possessed three-fourths of global invested capital and produced half of the world’s manufactured goods. Through the Marshall Plan and other programs, the United States provided 26 billion dollars to aid Europe’s postwar recovery–a sum equivalent to 10 percent of one year’s GDP. Despite its aid programs, the nation’s reserves increased by nearly 6 billion dollars between 1946 and 1949. In 1950, it still possessed half the world’s gold, reserve currencies, and IMF reserves. Through the 1950s, more than 10 percent of GDP was devoted annually to defense and foreign assistance. In that era, America’s margin of economic primacy engendered a confidence that it could assume the burdens of upholding world order without undue sacrifice. These circumstances raised questions about the solidity of America’s extensive security commitments even before Trump’s election. With the end of the Cold War, these commitments lost their original rationale–the one most understandable to the general public. (Hence Trump’s past description of NATO as obsolete.) The international credibility of America’s security guarantees has nevertheless been maintained, not only by the continuing overseas deployment of U.S. forces, but also by the unequivocal and emphatic assurances of American statesmen, diplomats and military officers. To date, this has deterred major, overt challenges to them. So the promissory notes have not been cashed. But if Trump’s emphasis on ‘America First’ were to cause adversaries and allies alike to doubt that the United States would in practice honor commitments not obviously related to the nation’s own security, the result might well be to undermine the Pax Americana that has prevailed for so long. The world, as well as the United States, faces an uncertain future. John A. Thompson gained his B.A. and Ph.D. from the University of Cambridge where he is now Emeritus Reader in American History and an Emeritus Fellow of St Catharine’s College. His original research interest was progressivism but in recent decades he has switched his attention to the history of U.S. foreign policy and how it has been interpreted. His previous publications include A Sense of Power: The Roots of America’s Global Role (Cornell University Press, 2015), Progressivism (Durham, 1979), Reformers and War: American Progressive Publicists and the First World War (Cambridge University Press, 1987), Woodrow Wilson (Longman, 2002) and many articles in a variety of journals. This essay was written in late January 2017. See Thomas Wright, “Trump’s 19th-century foreign policy,” Politico, 22 January 2016. Barry R. Posen, Restraint: A New Foundation for U.S. Grand Strategy (Ithaca: Cornell University Press, 2014); Eugene Gholz, Daryl G. Press and Harvey M. Sapolsky, “Come Home, America: The Strategy of Restraint in the Face of Temptation,” International Security 21:4 (Spring 1997): 5-48. Justus D. Doenecke, In Danger Undaunted: The Anti-Interventionist Movement of 1940-1941 as Revealed in the Papers of the America First Committee (Stanford: Hoover Institution Press, 1990), 9. For a fuller analysis of the history so baldly summarized in the following paragraphs, see John A. Thompson, A Sense of Power: The Roots of America’s Global Role (Ithaca: Cornell University Press, 2015). Robert E. Gallman, “Economic Growth and Structural Change in the Long Nineteenth Century,” in The Cambridge Economic History of the United States, ed. Stanley L. Engerman and Robert E. Gallman (New York: Cambridge University Press, 2000), 2-6; Paul Bairoch, “International Industrialization Levels from 1750 to 1980,” Journal of European Economic History 11 (Fall 1982): 269-325. On the tension between this evangelical mission and a universal system of collective security, see John A. Thompson, “Wilsonianism: the dynamics of a conflicted concept,” International Affairs 86:1 (January 2010), 29-30. Adam Tooze, The Deluge: The Great War and the Remaking of Global Order (London: Penguin Books, 2014). Curt Cardwell, NSC 68 and the Political Economy of the Early Cold War. New York: Cambridge University Press, 2011, 175. Robert J. Lieber, Power and Willpower in the American Future: Why the United States is Not Destined to Decline (New York: Cambridge University Press, 2012), 123. Chris Murphy, “Marshall plans, not Martial Plans.” New York Times, 3 January 2017, 9. Chicago Council on Global Affairs, Foreign Policy in the Age of Retrenchment, 2014. Next Next post: Policy Series: Why Does Donald Trump Have So Much Trouble with the Truth?